5 cards Show Hand is play by 2- 4 players with 28 poker cards inlcude 4 suits : spade, heart, diamond and square for 8,9,10,J,Q,K and ACE. The way to win the game is to have the best 5 cards hand at the show down and to persuade all the other players to fold. 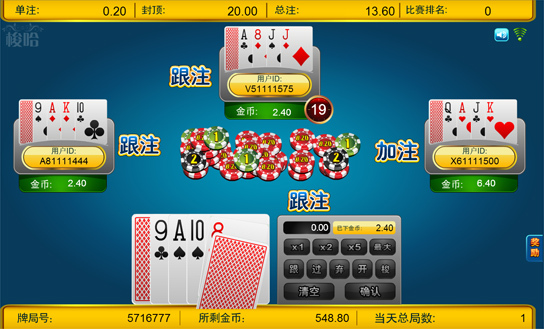 The games begins by system deducted player's initial bet according to the table limit and dealt one card face down to each player (the hole card) and then one card face up. The first betting round is begun by the player with the highest face-up card and choose to bet, pass or fold. When the betting round is complete the dealer deals another face up card to each player and there is another betting round, begun by the player who currently has the best hand showing. This is repeated until each player has five cards - one face down and four face up - and after the final betting round there is a showdown between the survivors. If at any point only one active player remains, that player automatically wins the pot without having to show any cards. If no player has bet so far in the current betting round, and the value of chips contributed by all active players is equal, you have two options at your turn. Pass : if a player do not wish to bet more chips at the moment, but remain active and reserve the right to take part in future betting. In the first betting round, when all players have contributed. Bet : Player bet some more chips by pushing them towards the pot. The amount must be between the minimum and maximum limits currently in force. Call : When you call, you bet enough to match what has been bet since the last time you bet. Raise : When you raise, you first bet enough to match what has been bet since the last time you bet (as in calling), then you 'raise' the bet another amount which is not exceed the typically limit. Fold : You drop out of the hand, discarding your cards face down onto a discard pile, which is known as the muck. No player is allowed to see the cards you discarded. You will take no further part until the next deal, and any chips you have placed in the pot are lost to the eventual winner of the pot. All in : Player bet the highest limit of the game and its only allowed after 1st betting round. Royal Flush Five consecutive cards of the same suit. Ace can be counted as high to make the highest type of Royal Flush, which is A-K-Q-J-10 of a suit. Four of a Kind Four cards of the same rank and one other card, such as 9-9-9-9-Q. Full House Three cards of the same rank plus a pair of cards of another rank, such as 5-5-5-K-K. Flush A flush consists of five cards of the same suit (not all consecutive, otherwise it would be a Royal flush). Straight Five cards of consecutive ranks, not all of the same suit. The highest is A-K-Q-J-10. Three of a Kind Three cards of the same rank and two cards of different ranks - for example 7-7-7-10-6. This is sometimes known as a triplet or trips. Two Pair Two cards of one rank, two cards of a second rank and one card of a third rank (the kicker) - for example A-A-9-9-8. Pair Two cards of equal rank and three cards of different ranks - for example Q-Q-A-8-7. Nothing A hand which does not fit any of the categories above, commonly known as High Card or sometimes No Pair. That is: five cards of different ranks, not all consecutive and not all the same suit.